Liver retransplant is the last and only treatment for patients with irreversible graft failure. It is recognized as a high-risk procedure; thus surgical difficulties are multiplied with every successive liver transplant. Liver retransplant is a demanding technical procedure for the surgeon, with no guarantee of postoperative and long-term survival. Here, we report a 29-year-old male patient who underwent a liver transplant in April 2009 due to primary sclerosing cholangitis with overlapping autoimmune hepatitis. The patient underwent liver retransplant in May 2012 due to graft failure. A second liver retransplant was performed in April 2013 using the classical technique. An inflammatory process involving the inferior vena cava and diaphragm forced the surgeon to open the pericardium from the diaphragm and clamp the cuff of the right atrium to perform a hepatoatrial anastomosis of the inferior vena cava. The next steps were performed as for a typical liver transplant. Postoperative stay was free of complications and was not prolonged. Immuno­suppression regimen was kept standard. During our follow-up of more than 32 months, the patient continued to show good results. A consecutive hepatectomy in the same recipient is associated with an increased risk of intraoperative complications. When excessive adhesions limit a safe and functioning cavocaval anastomosis, a hepatectomy with the excision of the intrahepatic inferior vena cava and end-to-end anastomosis through a pericardial window for the extension of the recipient's’ vena cava cuff are feasible options. We found that a hepatoatrial anastomosis does not impair good overall outcomes and long-term results. Liver retransplant is the last and only treatment in patients with irreversible graft failure. Second and third liver transplant procedures are associated with higher morbidity and intraoperative mortality and shorter long-term survival. Furthermore, repeat procedures generate higher costs compared with primary liver transplant due to prolonged hospital­ization and increased use of packed red blood cells (PRBC) and packed fresh frozen plasma (PFFP); in addition, more perioperative com­plications occur. Data remain limited concerning the technical difficulties, later complications, and long-term results of complex liver transplant procedures. 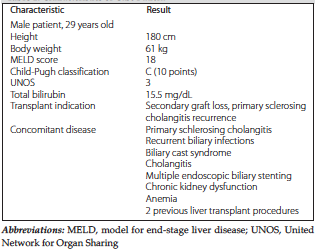 A 29-year-old Polish male patient (Table 1) was initially transplanted in April 2009 due to primary sclerosing cholangitis with overlapping autoimmune hepatitis. In May 2012, he underwent a second liver transplant due to repetitive episodes of cholangitis and end-stage graft failure. Liver transplant was performed using the classic technique with an end-to-end anastomosis of the inferior vena cava (IVC). After discharge, the patient was hospitalized several times due to recurrent cholangitis. This was treated by endoscopic retrograde cholangiopancreatography and biliary stenting. Biliary abscesses, ascites, and chronic renal dysfunction were concomitant with primary sclerosing cholangitis of the second graft. At 3 months after transplant, the patient was no longer qualified for retransplant due to anticipated excessive intraoperative bleeding, dense scarring, high risk of postoperative bacteremia, and ongoing poor kidney function. It was concluded that surgery outweighed the chances for a good outcome. After another 3 months of intense internal treatment, the patient was qualified for a third liver transplant. In mid-April 2013, with a consecutive episode of cholangitis, he was admitted to our department and treated by nasobiliary drainage. Computed tomography showed hepatic abscesses and ischemic lesions in the liver. Graft loss was put forward as a diagnosis with an overlapping biliary cast syndrome, secondary anemia, and chronic renal insufficiency. Subcostal abdominal access showed distorted anatomic orientation due to dense and solid postinflammatory adhesions surrounding the liver graft. With much difficulty, the intestines were dissected from the visceral side of the graft. The hepatoduodenal ligament (HDL) was then exposed; however, because of thick, solid, and porcelain-like adhesions, none of its structures were identified. A mass clamping test was performed to check whether hemodynamics remained stable. After the previous limb of the Roux-en-Y loop was identified, the biliary anastomosis was dissected and mobilized from the liver. The nasobiliary stent was then retrieved, and the distal end of the bile duct stump was ligated. Mass clamping of the HDL was performed, and sharp dissection identified the grafts’ hepatic artery. The portal vein was dissected and cannulated. A venovenous bypass was fully engaged with a stabilized flow of 2 L/min. Both regions of the IVC were clamped and then cut, and graftectomy was completed. However, because of adhesions embodying the subdiaphragmatic part of the IVC, the vascular clamp seemed unstable and at ease of loosening the IVC; it also offered a scarce cuff for anastomosis. An attempt to place a second clamp above the first one onto the hard distorted diaphragm failed. To overcome this obstacle, an excision was made in the diaphragm (Figure 1), and a window in the pericardium was excised. This created a comfortable exposure of the pericardial part of the IVC, and the vascular clamp was then placed on the right atrium, allowing for appropriate preparation of the IVC cuff for anastomosis (Figure 2). Clamping of the right atrium did not cause cardiac arrhythmia or hemodynamic instability, and electrocardiogram results remained normal. 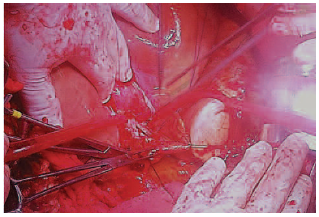 A hepatoatrial end-to-end anastomosis was per­formed. The pericardial window was left unsutured with a small passage between the pericardium and right pleural cavity. Two drains were placed into right pleural, which was suture ligated and separated from the abdomen; at that time, suction drainage was initiated. Portal anastomosis was followed by graft reper­fusion with cold ischemia time at 5 hours, 15 minutes, without a reperfusion syndrome and body temperature of 35.2°C to 35.5°C. Dissection of the hepatic artery was performed until the previous arterial anastomosis was exposed. The celiac trunk of the graft liver was sutured to the recipient’s proper hepatic artery. A hepaticojejunostomy was performed using the previous limb of the Roux-en-Y loop. Although a fairly long trial was conducted, abdominal closure lacked complete hemostasis. Hemostatic agents such as fibrin glue and oxycellulose were used. The unhepatic phase totaled 55 minutes. Total liver transplant time was 7 hours, 20 minutes, minimum blood pressure was 60/25 mmHg, mean central venous pressure was 8 mmHg, and total fluid transfusion was 16 liters without the use of amine pressors. The patient required 50 units of PRBC and 41 units of PFFP; 3 units of platelets and 2 units of human prothrombin complex (Octapharma LTD) were transfused. The patient remained hemo­dynamically stable, with proper diuresis and moderate hypothermia when discharged from the operating room. The patient was extubated in the transplant intensive care unit on the same day of the transplant procedure and remained with sufficient respiratory and circulatory values. An echocardiography was performed on the second postoperative day, which confirmed good results and ruled out any suspicion of cardiac disabilities. The pleural drainage was removed on the third postoperative day, and chest radiography confirmed no signs of pneumothorax and minor effusion in the right pleural space. The abdominal drains were removed on the second and fourth postoperative days. Total hospitalization in the transplant intensive care unit was 13 days. Renal function was sufficient with no need of further hemodialysis. Rehabilitation was intensified to twice daily. On postoperative day 13, the patient was moved to the general hospital ward. He was discharged on postoperative day 19 with good overall results. During follow-up (32 months at time of writing this article), magnetic resonance imaging (Figure 3) showed efficient hepatoatrial anastomosis, no abdominal findings, and good long-term results (Table 2). Consecutive liver retransplant procedures in a single patient remain a challenging and demanding operation for the surgeon.1-3 Therefore, appropriate patient selection and time to transplant are important factors when deciding to perform a second or third liver transplant. Because liver retransplant results are statistically worse than results for a primary liver transplant,3-7 decisions have to be made with the understanding that success in this procedure is never a guarantee. Liver retransplant as we all know is associated with higher costs in general.7,8 As also shown in our report, PRBC and PFFP use alone multiplied the normal dependence on transfusion units. Due to risks arising from pleural drainage, abdominal clot organization, and immobilization, the patient’s transplant intensive care unit stay was extended; thus costs were elevated. However, with good intensive care and rehabilitation, an overall postoperative stay of under 3 weeks, which if not for the preoperative hospital stay, would be cost sufficient. Mobilization of the liver is almost always as­sociated with excessive bleeding that is difficult to control throughout surgery.9,10 Extended hepa­tectomy and time to reperfusion will have a negative influence on the outcome; however, during liver retransplant, it means more PRBC, PFFP, and fluid transfusion during slow or no surgical progress, and this may directly affect the intraoperative outcomes. Patient hypothermia is another important issue that is often difficult for anesthesiologists to completely resolve. The above factors are typical for liver retransplant procedures; that is, although significant preparations are made to avoid them, they always accompany this procedure. Therefore, extra units of PRBS and PFFP should be reserved. As mentioned, survival rates after consecutive liver retransplants are generally worse than during the first transplant. Our clinical results are similar to those reported in the literature.11-13 This patient was retransplanted almost 1 year from the previous liver retransplant. Influenced by experience coming from other centers, we postponed the liver retransplant by nearly half a year so as to achieve a better outcome.4,8,10,14,15 Liver retransplant is associated with dense adhesions, altered anatomy, and difficulties in identification of vascular structures. Mass clamping of the HDL can shorten graftectomy. As in our case, computed tomography does not show the toughness of adhesions surrounding the IVC. The impossibility for typical IVC anastomosis called for a prompt decision to be made, and with that a peritoneal-pericardial window was excised. The outcome was good, and postoperative convalescence was not impaired due to this procedure. Use of hepatoatrial anastomosis in rare and difficult cases proves to have no negative effect on postoperative long-term results. Appropriate intensive care and rehabilitation are mandatory, but postoperative hospitalization is not excessively prolonged. The immunosuppression regimen remained standard in our patient. The key point is to assess whether the recipient’s suprahepatic IVC cuff is welcoming to the surgeon. It is always safer to perform an end-to-end cavocaval subdiaphragmatic anastomosis; however, during a consecutive retrans­plant, if this is not possible, a peritoneal-pericardial window may be the only access toward a successful anastomosis. A consecutive hepatectomy in the same recipient is associated with an increased risk of intraoperative complications. In cases where excessive adhesions limit a safe and functioning cavocaval anastomosis, a hepatectomy with the excision of the intrahepatic IVC and end-to-end anastomosis through a pericardial window for the extension of the recipient's’ IVC cuff are feasible. We found that a hepatoatrial anastomosis does not impair good overall outcome and long-term results. Mora NP, Klintmalm GB, Cofer JB, et al. Results after liver retransplantation in a group of 50 regrafted patients: two different concepts of elective versus emergency retransplantation. Transpl Int. 1991;4(4):231-234. Nyckowski P, Krawczyk M, Zieniewicz K, et al. Liver graft bile duct necrosis--indication for retransplantation. Ann Transplant. 1997;2(2):70-74. Zimmerman MA, Ghobrial RM. When shouldn't we retransplant? Liver Transpl. 2005(11 Suppl 2):S14-20. Uribe M, Buckel E, Ferrario M, et al. Pediatric liver retransplantation: indications and outcome. Transplant Proc. 2007;39(3):609-611. Biggins SW, Beldecos A, Rabkin JM, Rosen HR. Retransplantation for hepatic allograft failure: prognostic modeling and ethical considerations. Liver Transpl. 2002;8(4):313-322. Hong JC, Kaldas FM, Kositamongkol P, et al. Predictive index for long-term survival after retransplantation of the liver in adult recipients: analysis of a 26-year experience in a single center. Ann Surg. 2011;254(3):444-448; discussion 448-449. Azoulay D, Linhares MM, Huguet E, et al. Decision for retransplantation of the liver: an experience- and cost-based analysis. Ann Surg. 2002;236(6):713-721; discussion 721. Pfitzmann R, Benscheidt B, Langrehr JM, Schumacher G, Neuhaus R, Neuhaus P. Trends and experiences in liver retransplantation over 15 years. Liver Transpl. 2007;13(2):248-257. Akpinar E, Selvaggi G, Levi D, et al. 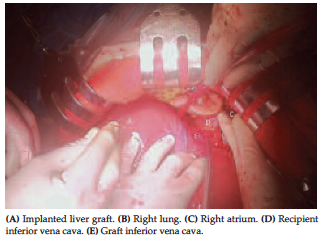 Liver retransplantation of more than two grafts for recurrent failure. Transplantation. 2009;88(7):884-890. Marudanayagam R, Shanmugam V, Sandhu B, et al. Liver retransplantation in adults: a single-centre, 25-year experience. HPB (Oxford). 2010;12(3):217-224. Vivarelli M, La Barba G, Legnani C, et al. 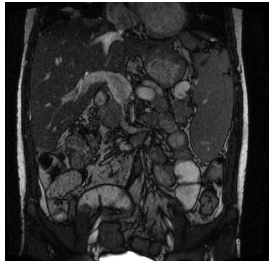 Repeated graft loss caused by recurrent hepatic artery thrombosis after liver transplantation. Liver Transpl. 2003;9(6):629-631. De Carlis L, Slim AO, Giacomoni A, et al. Liver retransplantation: indications and results over a 15-year experience. Transplant Proc. 2001;33(1-2):1411-1413. Markmann JF, Markowitz JS, Yersiz H, et al. Long-term survival after retransplantation of the liver. Ann Surg. 1997;226(4):408-418; discussion 418-420. Newell KA, Millis JM, Bruce DS, et al. An analysis of hepatic retransplantation in children. Transplantation. 1998;65(9):1172-1178. Acknowledgements: This work was supported by the Department of General, Transplant, and Liver Surgery, Medical University of Warsaw, Poland. The authors have no conflicts of interest to report. Author contributions were as follows: KK designed the report; KK, PN, PS, GN, JP performed the surgical procedure; PM, WF, MW postoperatively treated the patient; KK, PM, MW collected the patient’s clinical data; KK, PN, PM, WP, MK analyzed the data; KK, PN, MK wrote the paper.